I love sauce. And I’m a saucy gal, so it works out perfectly. And, when I was charged with making an Easter appetizer of the green variety, you can be sure I was looking for something that was worthy of some serious sauce slathering. Tender, green asparagus bundled up and wrapped in puff pastry…oozing with melted parmesan cheese…drizzled with a lemon-garlic aioli? Yup. Recipe(s) found. Results devoured. I usually end up combining a few elements of different recipes to suit my culinary needs and then revise them a bit further. And this time was no different. I took the puff-pastry from one recipe, removed the butter and the cream cheese, added more parmesan cheese and topped it off with an aioli from another recipe. Here’s how I achieved these tasty treats…but you can check out the original recipes here and here. Grab a box of puff pastry sheets (in the freezer section, usually by the Cool Whip) and let them thaw for at least 40 minutes. About halfway through the thawing time I gently unfolded the sheets and then left them in the fridge until I was ready to assemble…that way they didn’t get too sticky. For the sauce…you can prep it ahead of time, and know that the recipe makes a TON and could easily have been halved for the ten bundles I made (each with three stalks of asparagus). But then there wouldn’t be leftovers, so don’t even bother halving it! So…add your 1/2 cup mayo, 1/2 cup sour cream (could easily substitute greek yogurt), grated clove of garlic, three squeezes of lemon juice and zest, a dash of dijon, a shake of red pepper and a splash of hot sauce if you like. Ok, back to the recipe. Now that your dough is thawed and your sauce is in the fridge, wash and trim your asparagus and lay to dry on some paper towels. On a lightly flowered surface cut the puff pastry dough into vertical strips, going in the same direction as the crease that’s already there. I got 10 strips out of each sheet for a total of 20 strips. Next, grate a TON of parmesan cheese all over your strips. Grab one, two, three – heck, however many asparagus stalks you want in your bundles – and start rolling them up. 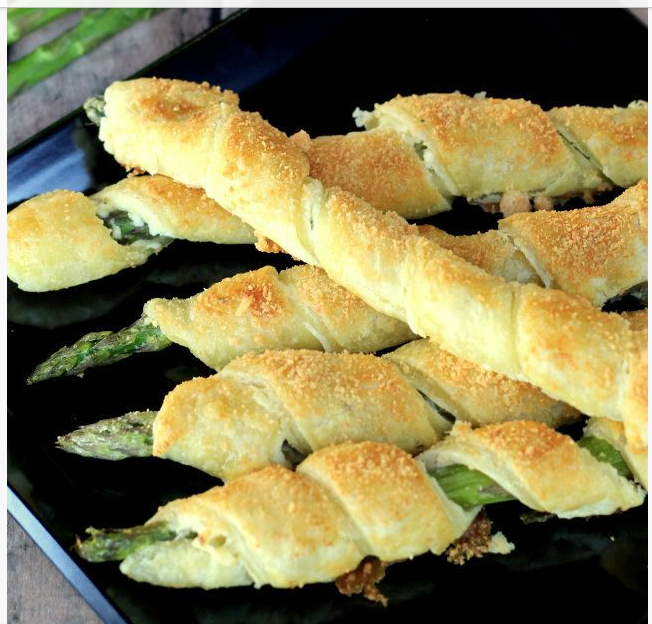 I found it easiest to hold the bottom of the asparagus bundle at a 45 degree angle, flowers pointing down, at the top of the puff pastry strip. From there, just roll the bundle down the strip and spiral the puff pastry strip from the bottom of the bundle…finishing at the top. I’m sure you had to read that twice. This isn’t a food blog, so sorry my culinary descriptions aren’t on point. But. Look at the picture above and you’ll figure something out. Or, you can wrap it some other way. You’re smart, I know you are. And, it will all be delicious no matter what you do. Next up, bake at 400 degrees for 10-20 minutes. That’s generally how vague my cooking times are. Just check on it and figure out when it’s done! When they’re cooling, add a little more fresh grated parmesan on top so it melts over the buttery puff pastry. Then, obviously, add sauce and enjoy. This would be amazing even without the puff pastry, if you’re looking for more of a legit vegetable side dish. Just bake your asparagus, grate parmesan cheese on top to melt and then drizzle with the lemon-garlic aioli. And, you could even substitute the mayo or the sour cream for greek yogurt for a more healthy drizzle.